Roj Spendarmad Mah Dae, 1382 Yz. With these apt words, Firdausi begins his account of the birth of the greatest warrior the world has even seen. Soon Rodabeh became pregnant. Her happiness was short lived and soon gave way to misery and heartburn. The extreme size of her foetus caused her great discomfort. At three months, she could not even walk, and as the pregnancy advanced, it seemed certain that either mother or the unborn child would have to be sacrificed. As she reached nine months, Rodabeh began to get spells of fainting and it was at one of these times, that those around her feared the worst. As her nurses rushed to Zaal and gave him the worrying news, the great warrior remembered his Mazdayasni master, the Simorgh. Immediately he held the talisman given by the saint in the fire and ere the Bird of God appeared in front of him and blessed him. The Mazdayasni Master reassured the worried father-to-be, and reminded him that befitting the stature of his unborn child as the greatest forerunner of Prophet Zarathushtra, both his entry into and exit from this world would be unique and unparalleled. The Simorgh explained to Zaal that it would not be possible for the child to descend into the world through the normal route, and advised him to contact a noted Mobed, who was also a Master Surgeon of that time. 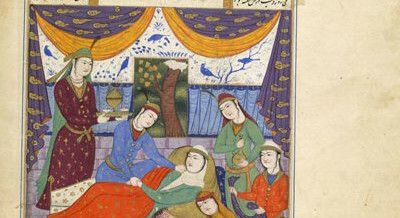 As the learned one arrived, the Simorgh directed that a certain type of sleep inducing wine be administered to Rodabeh. As her consciousness dulled, the Master Surgeon made an incision on the mother’s abdomen and delivered the child safely. He then applied certain pain relieving and wound healing herbs on the incision. After his departure, the Mazdayasni Master, through his Amal of certain Manthras caused the wound to heal immediately, and the mother to recover speedily. 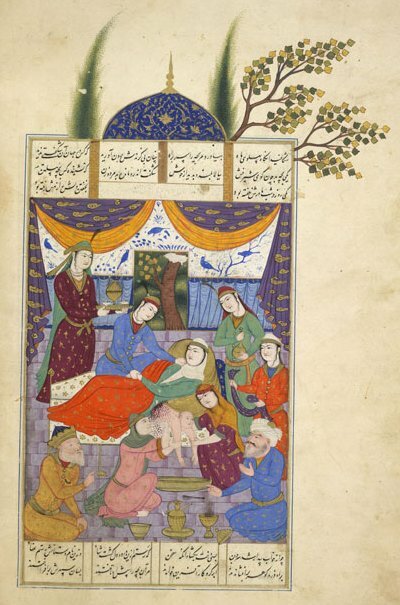 In this manner, we see that just as the Prophet Zarathushtra was born in a unique manner, laughing at His birth and praying the Ahunavar, so also his principal forerunner Rostam was born vide the world’s first ‘Caesarean’ operation. It is of course a different matter that this event took place nearly 6000 years before Julius Caesar’s so-called birth which lends its name to the procedure even today! This wonderful illustration from an old painted manuscript of the Shah Nameh vividly captures the scene. These couplets of Firdausi are not exaggeration or mere poetic license, but are real pointers to the exceptional stature of Rostam. Our revered Master, Ustad Saheb Behramshah Shroff explained that the spiritually very advanced soul of Rostam was born with a certain aura and many skill-sets relating to his future mission were already ingrained in his body. He never had to be taught how to use the various weapons of his age – he was born with their mastery. These wonderful revelations of the spiritual stature of Rostam and the exalted position of his family and lineage are explained in the fifth lecture of the series. Please click the icon below to download the MP3 file.